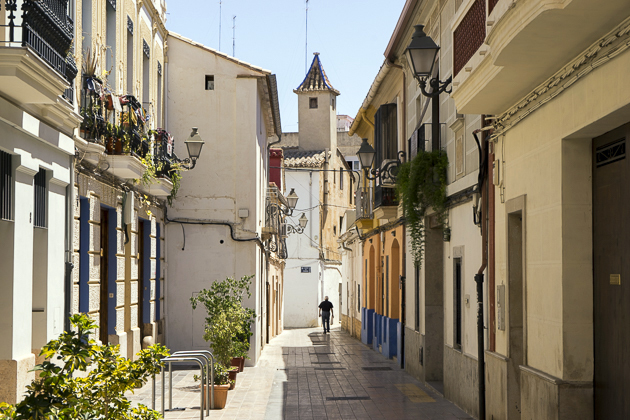 If the low-lying fields which surround Valencia are known for rice and horchata-producing chufas, then the mountainous areas farther inland are known for wine, particularly the endemic Valencian variety called Bobal. We made a trip to the province’s most important wine-producing region, Utiel-Requena, to visit the popular Hoya de Cadenas vineyards. Bobal is not the most well-known Spanish wine, a title which must belong to Tempranillo, but it is the most widely-cultivated grape in the Valencian Community. It’s a sturdy plant, native to Utiel-Requena, which is perfectly adapted for the region’s frosty winters and sweltering summers, as well as its paltry rainfall. We first encountered Bobal a few years ago. It has a rich, fruity taste and dark red color, and since we had never heard of it before, we assumed this must be a very fancy grape. Turns out, Bobal is mainly used in producing bulk wines, and doesn’t have a sterling reputation among connoisseurs. The main reason we hadn’t heard of it, is because cheap Tetrapak wine doesn’t advertise which grapes it’s using. But whatever. 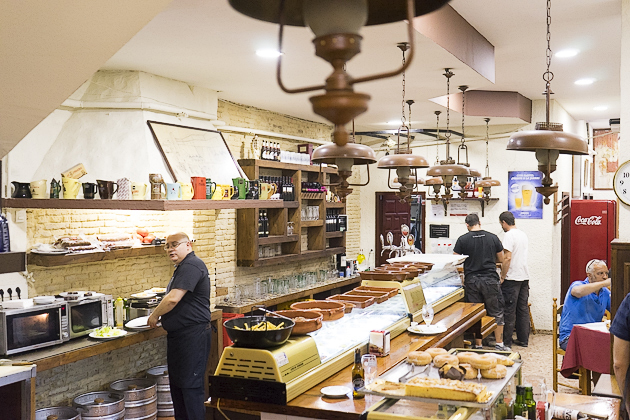 We like it, and it’s easy to find quality bottles of Bobal at bargain prices. In the Utiel-Requena region, where there are over 100 wineries, it’s far-and-away the most-produced grape. We visited one of the largest companies, Hoya de Cadenas, to see the fields in which Bobal grows, tour the estate’s famous cellar, and try out a few of the wines. Hoya de Cadenas is an estate owned by the Bodegas Vicente Gandia, a company which has been making wine since 1885. 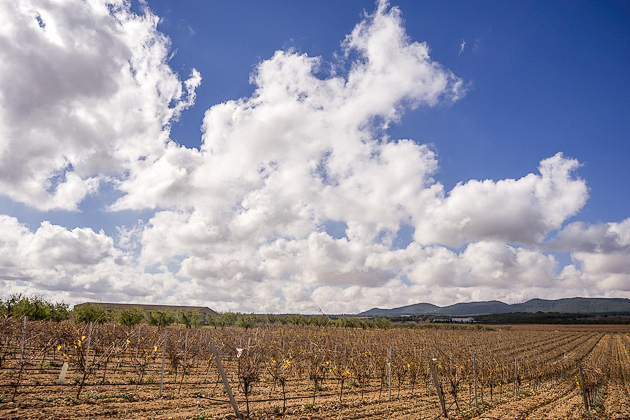 It’s one of the biggest wineries in Spain, with distribution stretching around the globe, and it was also the first company within the Valencian Community to begin bottling wine. We showed up at noon for our tour, and were dismayed to see that we’d be joining a group of about sixty Spaniards, most of whom knew each other, a few of whom already seemed drunk, and all of whom were ready to party. But the tour’s 100-decibel buffoonery was more entertaining than annoying, and the size of the group only served to underline the considerable popularity of Hoya de Cadenas. After clambering aboard a mini-train, we took a short trip through the grape fields. The plants had just been pruned, and the thousands of bushes with bare branches provided a peaceful and melancholy sight. And then the drunk girl who had squeezed in next to me on the train let out a belch, which sent her drunken friend into hysterics, and snapped me out of my wistful mood. We pulled up to the old estate house, built in 1820, where Vicente Gandia’s family lived, and which is still inhabited by the current owners of the Hoya de Cadenas. The bottom floor is open to visitors and retains much of its original decoration and furniture. After crossing the estate’s courtyard, spotted with ancient olive trees, we entered the former wine cellar, where pressed grapes were left to ferment in the good-old days before health regulations. Today, this cellar has been converted into an art gallery, with dozens of wine barrels painted and decorated by famous Spanish artists. Kind of cool, and not at all what I was expecting to see on this tour. We now moved to the modern fermentation room with its dozens of massive vats, and then followed our guide underground into the cellars. Thousands of barrels were arranged on grids, and the smell was intoxicating, probably literally so. Adjacent to the cellar is the tasting room where our tour would end… but Jürgen and I allowed the rest of our thirsty group to plow ahead of us, while we remained alone among the barrels, huffing fumes for a few blissful minutes. On rejoining the herd, we had the chance to try three types of wines: a sweet, semi-sparkling aperitif, a mid-priced Bobal, and a more expensive “reserve” which stays in its barrel for a year. Surprisingly, we both preferred the cheaper wine: its name is “Bo” and it’s sold all over Valencia. If you’re interested in a similar experience with Hoya de Cadenas, call in advance to make a reservation; it can fill up quickly. There are probably smaller, more intimate tours to be had in Utiel-Requena, but this was a fun way to learn about Valencia’s most important grape. Tasting Valencia's Wines at Hoya de Cadenas If the low-lying fields which surround Valencia are known for rice and horchata-producing chufas, then the mountainous areas farther inland are known for wine, particularly the endemic Valencian variety called Bobal. We made a trip to the province's most important wine-producing region, Utiel-Requena, to visit the popular Hoya de Cadenas vineyards.